Mealtime is about so much more than food. What we eat has long-term effects on our health and quality of life. But sometimes who we eat with can be just as important. Feeding America reports that “Seniors face a number of unique medical and mobility challenges that put them at a greater risk of hunger. Many are forced to make the tough choice between buying food and medicine, and others struggle to access food without reliable transportation.” As of 2017, “More than 5 million senior citizens age 60 and older struggle with hunger. National statistics show that only 1 in 6 seniors who are experiencing hunger actually access programs like those that Senior Services offers. 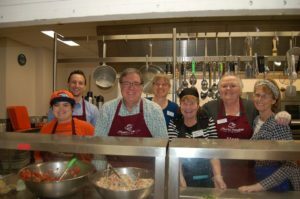 At the Senior Services for South Sound’s Senior Nutrition department, they have options for mobile and home-bound seniors. 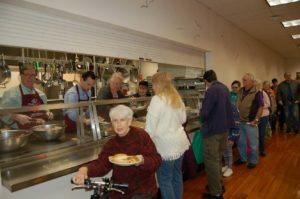 Community Dining offers healthy lunches to Mason and Thurston county seniors while Meals on Wheels volunteers deliver both hot and cold options to those unable to travel. Senior Nutrition Program Director Cathy Visser explains that in 2017 alone, they served more than 120,000 meals to 3,000 seniors in our area. Cathy uses her experience as a registered dietitian and nutritionist to write menus, train staff, and keep the food flowing. 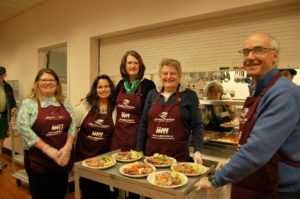 While other Meals on Wheels programs are leaning towards premade meals provided by outside vendors, Senior Services depends on community food donations, and individual cash donations to continue making healthy meals that are mostly made from scratch. 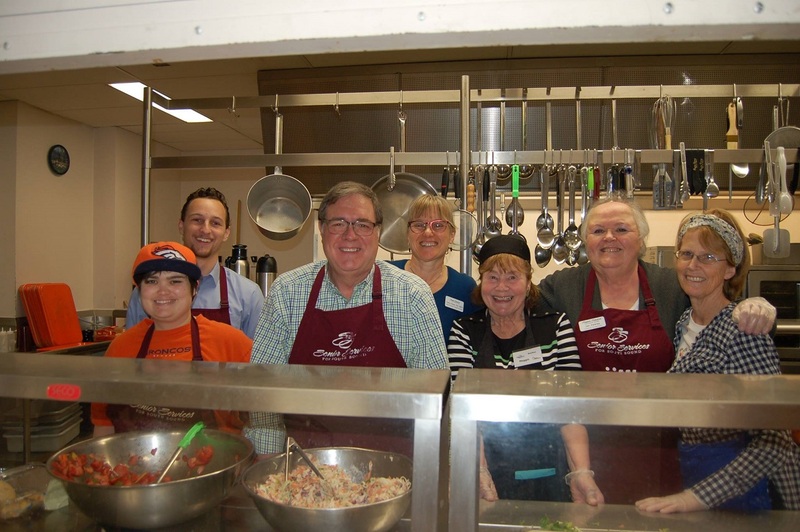 Community dining offers a healthy meal with plenty of social time. Meals are $6 or less, depending on income, and open to everyone. These are held at the Olympia Senior Center, Virgil Clarkson Lacey Senior Center, Yelm Adult Community Center, Tenino Quarry House, Rochester United Methodist Church, Faith in Action Senior Services, and The Pavilion at Sentry Park. For those unable to leave home, Meals on Wheels volunteers deliver hot meals three days a week and home-prepared chilled meals to last through the other four. All food is purchased and prepared locally. “We track all meals we serve very carefully,” says Visser. But Meals on Wheels is also a valued—and valuable—social time for many seniors proving that it is more than a meal. “Some are isolated, living alone and these drivers may be the only person they see all day,” admits Visser. “The social contact is important.” To qualify for Meals on Wheels, on only needs to be 60 or older, have difficulty cooking on their own, be unable to leave their home without support, and have limited support. Funding for these programs comes from donations, grants and fundraising, and more than 150 dedicated volunteers. Look for upcoming charitable events on their website or the Senior Services for South Sound Facebook page. Few things are as restorative as a hearty, healthy meal with friends and family. Sitting down to home cooking restores body, mind and spirit. If you’d like to help make this a reality for local seniors, call the Nutrition Coordinator at 360-586-6181, extension 124, or email nutritioncoordinator@southsoundseniors.org.